Various political and social organisations have expressed anguish over the deterioration in the law and order situation in the state and police attack on journalists here. Rohtak based journalists today started an indefinite dharna in front of the Deputy Commissioner’s residence to demand action against policemen who attacked photographer and two reporters of a local daily when they were on duty yesterday. The Indian Oil Corporation (IOC) has decided to hold back Rs 11,000-crore projects, including the Panipat refinery expansion programme, as the Haryana Government is dragging its feet over lifting 4 per cent crude oil entry tax and granting sales tax incentives for the project. Most of the over 100 soil and water conservation projects undertaken by the Forest and Agriculture Departments of Haryana, replicating pilot projects launched by the Central Government, have failed. In connection with the alleged murder of Raj Bala, who died of burns on Thursday, her husband Jagdish and son Nitin have been arrested. Both have been remanded in judicial custody till September 15 by a local court. Two children were allegedly hacked to death by their uncle in Maharana village of the district last night. The mother of the children also sustained serious injuries and has been admitted to the PGIMS, Rohtak. The Bhajan Lal faction for the Congress has mobilised peoples’ support for its September 9 Faridabad rally. Mr Kuldip Singh Bishnoi former legislator and son of Mr Bhajan Lal, addressed a meeting of workers here today. Union Minister for Consumer Affairs, Food & Public Distribution Shanta Kumar with Haryana Chief Minister Om Prakash Chautala at a meeting on kharif procurement arrangements in Haryana, at Chandigarh on Monday. The Chautala government has failed in every field and people feel cheated, alleged the general secretary of the Haryana Vikas Party (HVP), Mr Surender Singh, while addressing a press conference here yesterday. A havildar of the Haryana police was thrashed badly by residents at Ali Meo village in the district yesterday. He was a member of the police team which had gone to the village in connection with the recovery of some stolen items. The All-India Confederation of Scheduled Castes and Scheduled Tribes Organisations, an apex body of various Dalit organisations in the country, has been mobilising the Dalits to embrace Buddhism to express their resentment against what they call “the brahmanical social order” in the country. The demarcation work of the mining area near Bhadkhal village in the district has run into a controversy, following serious objections raised by a local journalist. The demarcation work was ordered by the Punjab and Haryana High Court recently. Three armed youths came to a filling station located on the G.T. Road here in the wee hours of today and decamped with cash worth Rs 42,000. The Patarkar Sanghrash Samiti, comprising different journalists’ associations, has threatened to launch a statewide agitation if the authorities did not concede to their demands. The Haryana CPM has expressed concern over the total failure of the government in checking the decline in the law and order situation. It castigated the Director-General of Police, Mr M. S. Malik, for “concocting” crime data and projecting an improvement on the law and order front. The fact is that the citizens are held to ransom by criminals, the CPM state secretary, Mr Inderjit Singh, said while quoting some instances. The CPM also took serious view of the nexus developing between the criminals and political echelons and considered it as the chief factor for the rot. The CPM said, Chief Minister Om Parkash Chautala, being in charge of the Home Department, could not escape responsibility for the plight in which people were forced to live in terror, with the goonda elements operating freely. The CPM has called upon all opposition parties, mass organisations, trade unions and common people to form broad-based action committees to make the administration accountable and defend themselves. It declared that the law and order issue would be an important point in its agitation from September 7 to 27. The Lok Jan Shakti, Haryana, has condemned the police for freeing the assassins of Gulshan Kumar, who were apprehended by the people immediately after the murder and later handed over to the police. The party has demanded immediate action against the erring policemen so as to restore confidence among the citizens. Former Minister Subhash Batra, Zila Parishad Chairman Dharam Pal Makrauli, Youth Congress leader Krishan Vir Myna, DCC President Shadi Lal Batra, MLA, BJP spokesman Pradip Jain and district BJP Chief, Mr Munish Grover were among those who have condemned the police brutality on the journalists. The President, Haryana Beopar Mandal, Mr Laxmi Chand Gupta and Mr Ashok Kaka, President, Rohtak Traders Association and Mr Vidya Bhushan Aghi from the Manav Sewa Sangh have also expressed solidarity with the agitating newsmen. The Indian Oil Corporation (IOC) has decided to hold back Rs 11,000-crore projects, including the Panipat refinery expansion programme, as the Haryana Government is dragging its feet over lifting 4 per cent crude oil entry tax and granting sales tax incentives for the project. If the government continues to be indifferent, the IOC may decide to implement these projects at its refinery in Baroda instead of expanding the refinery here. The Reliance’s refinery in Gujarat and the Hindustan Petroleum Corporation’s refinery coming up at Bathinda in Punjab do not have to pay crude entry tax and have also secured sales tax concessions. The IOC is reported to have informed the Petroleum Ministry that the project will not be financially viable if the heavy imposition of crude oil entry tax continues. On the one hand, the Chief Minister, Cabinet ministers and even the Speaker of the Haryana Vidhan Sabha are trying to woo investor from other countries, promising them land and other facilities and on the other hand the established units in the state are being forced to close down. It may be recalled that a group named BST Engineering was pressured to close down the unit for not fulfilling the conditions of the government. And now a reputed company of Karnal is reported by planning to shift its units to the South. Another company in Sonepat has already shifted its units to Uttar Pradesh and Madhya Pradesh. The government is levying 4 per cent local area development tax in place of octroi which was abolished a year ago. This has burdened the industries as they have to pay tax on all raw materials being brought in the state. Some industrialists say that they have to pay 20 times more tax than last year. The IOC’s plan included the expansion of the refinery from six million tonnes to 12 million tonnes per annum, 360 MW power project and a petrochemical complex. All projects have already received clearance from the Ministry of Environment and Forest and the company was to begin work on these projects. But due to the conditions laid down by the government, the state would be deprived of the investment and people of job opportunities. The refinery has provided direct and indirect employment to many people. The refinery also generates maximum revenue in the district. The failure of these projects has dealt a blow to efforts on soil and water conservation, flood control and maintaining the eco-balance, an expert at the Central Soil and Water Conservation Research and Training Institute told The Tribune here today. “Problems like the lack of coordinated efforts, low priority to long-term issues, focus on extensive coverage and targets related to the money spent have plagued such projects,” the expert said seeking anonymity. Surprisingly, the projects did not fail due to the lack of funds as the World Bank has been funding these in states. He said the insincerity’’ of those supposed to implement the projects might be a major reason. The expert said that the state government had been measuring the success of their efforts in terms of the money spent and the area covered instead of the quality of the area covered. Giving the example of the centrally funded National Watershed Development Project for Rainfed Areas, he said the agroforestry activity was a total failure. The necessary tools were not provided to farmers. There was no survey done before launching the project as to what tools were required, he said. There were no trained staff in the field in the important component of livestock management, leading to failure. The need was to either get this component implemented by involvement of the Animal Husbandry Department or taking trained staff on deputation. Most of the funds were targeted at soil and water conservation measures without assessing their impact on runoff and soil loss. Plant survival was ignored. The expert said that staff transfers were effected without keeping in mind the project life, which resulted in untrained persons handling the project. He noted that there was no follow-up of programmes executed earlier, though it was provided in the guidelines. Raj Bala stated in her dying declaration before the Chief Judicial Magistrate that following a quarrel over half-baked chapatis, her husband had lost temper, sprinkled kerosene on her and set her on fire. Her son also joined in and kicked her several times. She also said she had been subjected to cruel treatment frequently by her husband and others. On the basis of her statement, the police registered a case of attempt to murder under Section 307, IPC. Raj Bala’s condition deteriorated and she was rushed to a hospital in Delhi where she succumbed to her injuries. After a postmortem examination, her body was handed over to her brothers who cremated the body at her parental house in Bhalkhi Majra village, about 20 km from here. Following her death, Section 307 was converted to Sections 302 and 34, IPC. According to police sources, Kamlesh, wife of Vakil Singh, was sleeping on the roof of her house along with her children Vikas (7) and Nency (9) when Sahib Singh, her husband’s brother, allegedly attacked them with a sharp-edged weapon. The children died on the spot. The father of the kids rushed to the roof on hearing their screams. The attacker threatened him and escaped under the cover of darkness. He rushed his injured wife to the hospital. He reported to the police later that his brothers Sahib Singh and Suresh along with their wives had hatched a conspiracy to eliminate his family. He said his brothers suspected him of hiding ancestral booty in the house. The police has registered a case under Sections 302/307/450 and 120-B of the IPC and arrested three persons. The main accused is absconding. The Bhajan Lal faction for the Congress has mobilised peoples’ support for its September 9 Faridabad rally. Mr Kuldip Singh Bishnoi former legislator and son of Mr Bhajan Lal, addressed a meeting of workers here today. He declared that the Faridabad rally would pave the way for the ouster of the Chautala government. He said that the INLD had promised to provide free power and irrigation water to the farmers before it came to power, but now it had increased power tariff. He called the government a anti-farmer. 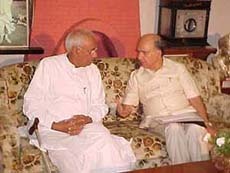 Later, talking to mediapersons, Mr Kuldip Singh exuded confidence that Mr Bhajan Lal would soon take over as Chief Minister as many INLD MLA who are fed up with the style of functioning of Mr Chautala had approached his father and were waiting for an opportune time to dislodge the government. He alleged that law and order situation in Haryana was at its lowest and no women felt safe. He also alleged that three was an exodus of industry from Haryana due to the anti-industry policy of the government. He declared that the HPCC president, Mr Bhupinder Singh Hooda, would also participate in the rally. He was in the district to address a youth conference. The HVP leaders and activists took out a procession, raising slogans against the state government. Mr Surender Singh lashed out that the government claimed to be pro-farmer, but it had burdened the farmers by increasing surcharge on fertilisers, pesticides and diesel without giving them a good support price for their crop. The farmers have also been harassed with the strictures proposed against the associated units of animal husbandry and dairy. The government had promised to provide free electricity and water, but failed miserably to supply it even after increasing their tariff. He claimed that the HVP was only party of the state which was discharging the responsibility of an effective opposition. He further alleged that while the law and order situation in the state was deteriorating, the Chautala government was forging cases against political opponents. The HVP leader said that Mr Chautala had rendered 10,000 youths unemployed through retrenchment and closing down of several units. The team consisting of six policemen had come from Punhana in Gurgaon district to check a vehicle reportedly carrying some stolen tyres. When the policemen reached the village, they were gheraoed by a mob wielding sticks. While the other policemen managed to escape, the havildar fell into their hands and was ‘mercilessly’ beaten up. As a result he was injured seriously. A case has been registered, but no arrests have been made so far. The mob also chased away the vehicle of the policemen. The All-India Confederation of Scheduled Castes and Scheduled Tribes Organisations, an apex body of various Dalit organisations in the country, has been mobilising the Dalits to embrace Buddhism to express their resentment against what they call “the brahmanical social order” in the country. The confederation will organise a ceremony at Ram Lila Ground here on November 4 in this regard. The confederation hopes that more than two lakh Dalits from Haryana alone would embrace Buddhism during the mass conversion function. The “dhamma vahan” a minibus fitted with a sound system and pictures of Ambedkar, Mr Ram Raj, Chairman of the confederation, and Lord Buddha, which has been touring all over the state to mobilise public support for its endeavour, reached here today. Mr Karamveer Singh, president of the state unit of the confederation, Buddhapriya Rahul, a nation ‘pracharak’ of the Buddhism, Mr Sooraj Bhan Rathi, district president of the confederation, Dr Mukhtiar Singh Saddar, state vice-president, and Mr Shammi Ratti, a former municipal vice-president, were present on the occasion. Talking to mediaspersons at the local PWD Rest House, Mr Karamveer Singh alleged that even after more than 50 years of independence, the Dalits were regarded as ‘second-rate’ citizens. He alleged that in the “brahmanicl social order” prevalent in the country, the Dalits were still as untouchables. He said like other parts of the country, Dalits in Haryana too had faced oppression at the hands of this social order over the years. He alleged that at many places Dalits were not allowed to enter the temples. Instances of atrocities on Dalits were on the rise. He cited examples of disorbing of a Dalit woman and her daughter in Fatehabad district recently, custodial killings of a Dalit boy in Rewari and asking a Dalit family to leave their village within 48 hours in Bhiwani district. He said no other religion of the world preached discrimination on caste basis as the Hinduism did. He said that more than two lakhs Dalits from Haryana would shave their heads and wear white clothes on November 4, 2001 rally in Delhi. Subhash Sharma, the local journalist, who had filed a public interest litigation (PIL) in the high court alleging illegal mining in Faridabad district, has now raised an objection over the demarcation work of the mining area in Bhadkhal village. In a letter to the Deputy Commissioner here, Subhash Sharma has alleged that the demarcation has not been done in a fair manner as the points of the earlier demarcation have been ignored. He said even the points of the Survey of India were not taken into consideration in this work. He said since he was a party to the case pending in the high court, he was keeping a close watch on the work and would not hesitate to challenge the report of demarcation in the high court. He alleged that the authorities were trying to favour a lease holder whose lease was cancelled by the state government recently. The high court had earlier ordered a CBI inquiry into the mining work going on in the district, in response to the PIL by Subhash Sharma. According to the police three armed youths came to the Modern Filling station at about 3 a.m. and entered its office where Shankar Gupta, cashier and a resident of local Saini Pura Colony, was keeping cash collected from a driver of a truck. After entering the room, they allegedly snatched the cash at gunpoint and escaped after bolting the door of the office. The local police has registered a case under the Arms Act. But no arrest has been made so far. The Haryana Government has placed the services of two IAS officers at the disposal of the Union Government with immediate effect. Mr D.P.S. Nagal, Joint Secretary, Power Reforms, will join the Defence Ministry as Deputy Secretary. Mr Vivek Joshi goes as Deputy Secretary in the Textile Ministry.